1000w ballast, bulb, and reflector combo! 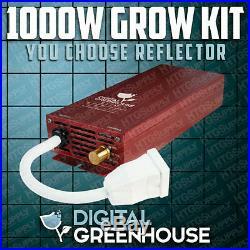 Comes with a Digital Greenhouse 1000w Slim Digital Ballast. At FULL POWER, this Ballast will operate at peak efficiency, driving the lamp / bulb to full output, delivering the energy your plants need to grow to their full potential. 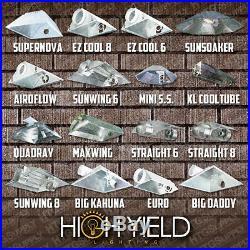 This Ballast operates 1000w High Pressure Sodium (HPS), Metal Halide (MH), and Metal Halide Conversion (MHC) lamps. Ballast has multi-volt capabilities which automatically adjust between 120v and 240v inputs. Utilizes Solid State Circuitry instead of out-dated Standard Core and Coil Ballast technology. Buit-in "Smart Chip" adjusts between HPS and MH lamps automatically. Choose between our most popular Reflectors. Lamp will not "sag" as is common in. (results in no "Hot Spots"). Aluminum Reflective insert for superior light reflectivity and light dispersal. 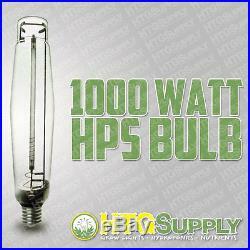 1000w HPS Bulb emits 150,000 Lumens. Universal Socket Set comes with all of our systems. Measurements: 19" L ; 16.5" W ; 6.5 H. Classic malleable "Bat Wing" style, bending inwards or outwards to change light dispersement. Measurements: 19" L ; 11.5" W ; 7 H. Small profile design and adjustable socket equates to large light dispersement. Measurements: 22" L ; 22" W ; 9.5 H. 9 Highly-reflective panels in a square design. Perfect for a 3x3 or 4x4 garden. Measurements (Respectively): 19" L ; 18" W ; 6" H // 21" L ; 18" W ; 8" H. Measurements (Respectively): 24" L ; 24" W ; 7" H // 48" L ; 48" W ; 11" H.
Adjustable Socket Bracket for ability to change light dispersement. The Mini SunSoaker is used for smaller gardens than the full-size SunSoaker. Measurements: 20" L ; 15.75" W ; 6.5 H. Tempered-glass lens and ventilation cover, which can be substituted for forced air ventilation. EZ COOL 6 / 8. Measurements (Respectively): 18" L ; 15" W ; 7.5 H. // 18.5" L ; 20.75" W ; 10 H. Tempered-glass lens and a 6" or 8" flange for forced air ventilation. Measurements: 20" L ; 24" W ; 8 H. Measurements (Respectively): 33" L ; 27" W ; 10 H. // 36" L ; 36" W ; 11 H. Extra Large Reflectors, perfect for larger gardens. 6' and 8 Flanges (respectively) can be swapped out for Vent Covers (included). Since flanges can be removed, they can also be repositioned in a "Smoke Stack" vertical position. Check and MO's are also accepted. Please call or message with any questions. QUALITY YOU CAN TRUST, SERVICE YOU CAN COUNT ON - At HTG we only offer products that deliver value and quality - we won't compromise our reputation to make a buck. We stand behind all of our items 100%, and we're here to help if there's ever an issue. With a feedback score of 680,000+ , you know you can rely on us for your garden's needs! WE WANT YOU TO SUCCEED - HTG Supply is a home-grown USA company, and we've been a part of the growing community for over a decade now. We operate our own retail website as well as 13 brick-and-mortar stores across the country, and we have a knowledgeable staff with real experience that can help you get what you need to achieve great results. The item "1000 watt DIGITAL SLIM GROW LIGHT KIT 1000w HPS w BALLAST BULBS HOOD MH sodium" is in sale since Tuesday, December 16, 2014. This item is in the category "Home & Garden\Yard, Garden & Outdoor Living\Gardening Supplies\Hydroponics & Seed Starting\Grow Light Kits". The seller is "htgsupply" and is located in Cranberry Township, Pennsylvania. This item can be shipped to United States.